I probably eat this for lunch more than anything else. 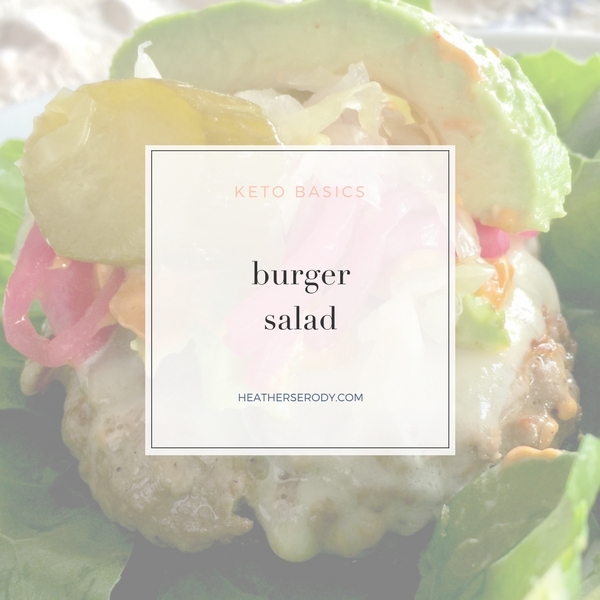 I mean, it's basically your favorite juicy burger with all of your favorite burger toppings (cheese, dill pickles, pickled onion, special sauce, avocado, bacon, ketchup…) plopped on top of a bed of sweet bibb lettuce. I just cut the whole thing up and eat it like a salad, because who can really manage to wrap a hot burger with lettuce to mimic a bun anyway? Not me. Just give me a cheeseburger salad! Grill or pan cook the burger to your desired doneness. Add cheese if desired. Allow to sit off the heat to allow the cheese to melt while you assemble the salad. Arrange lettuce all around the bottom of a plate or a wide shallow salad bowl to make a bed. Place the cooked burger in the center and top with all of your favorite burger toppings. Cut up and toss together to make burger salad.